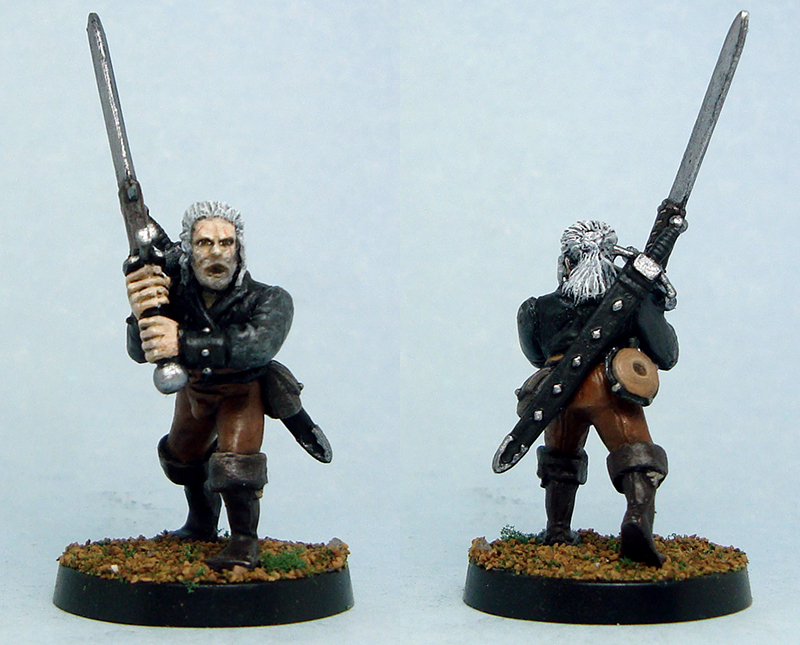 In my previous post I showed off my Witcher conversion, and a mere four days later he is fully painted! Much like the conversion, this was a fairly quick and rough job, mainly to ease me back into painting and to produce a painted miniature in a decent amount of time. I kept the palette quite muted, as Geralt (as the witcher character is called) is depicted as a sombre, battle-worn character. For the same reason I drybrushed the clothing fairly roughly to make them appear a bit more worn and dusty. The eyes were a special case. The fiction reports that witchers – the mutants that they are – have reptilian eyes. Surprisingly I got the eyes painted on the first try, so better knock on wood! Naturally I don’t have the camera to show it off, so you’ll just have to trust me. I added some stubble and scars as per most descriptions of the character. All in all, it’s not the prettiest of paintjobs, but still very serviceable. 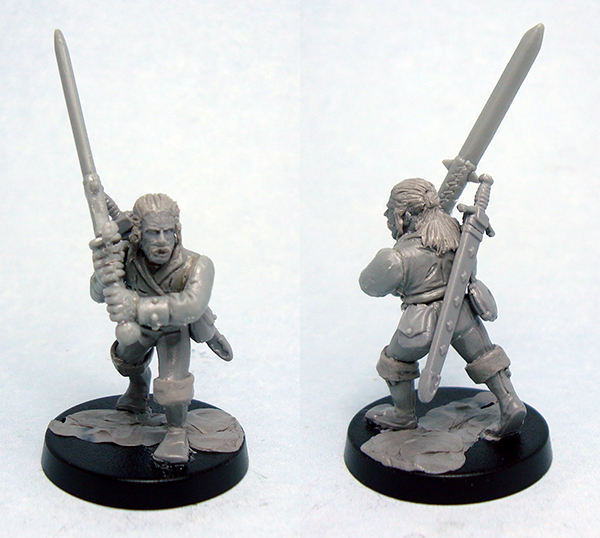 Seeing as he’s the first mini I’ve painted in some eight months, I’m happy enough with the plastic White Wolf of Rivia. New year, newfound enthusiasm! I can already feel myself getting interested in miniatures again – spending several hours today working on them is a sure enough sign. I figured I’d write a few words on the subject of getting back in the saddle after a half year long break, based on what I’ve been doing today. For me the important thing is to get going, to actually do something. I need to put water in that dried-out pot and give my paints a good shake if I ever actually want to paint something after a break. It doesn’t matter what I paint or whether I have a huge project planned, the crucial bit is getting things done. The first one is a piece from Leading Edge’s old Colonists’ Last Stand set. 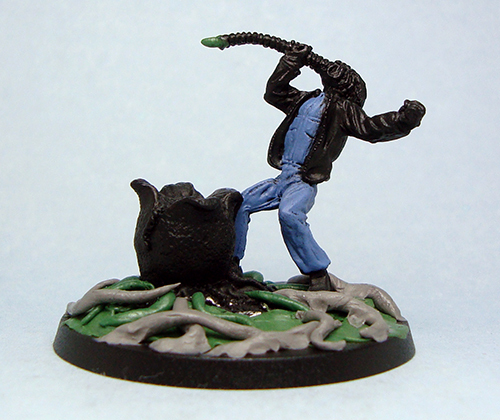 It’s a great mini, showing the fateful moment a facehugger latches on to an unsuspecting victim. As you can see from the photo, this one was in a half finished state. To make it fit in with the rest of my minis, I had glued it onto a circular base and added some xenomorph-y tendrils with greenstuff. I’d even undercoated it and given the victim’s coveralls their first layer of paint. The mini had then sat on my desk collecting dust before getting returned to the cupboard housing my un- and semi-painted miniatures. Why did I pick this one to finish? I’m on a bit of an Alien franchise kick again, after watching blu-ray versions of the first three films and reading two books: Alien – the Archive and The Art of Alien: Isolation. On top of this, the miniature was well on its way to being finished and I’ve always loved it. Not to mention that it doesn’t have a lot of fiddly detail, making it a pleasure to paint. It doesn’t have any real use as a gaming piece other than as an objective marker or something, but that’s okay. Actually, it just might be what makes it appealing right now. I took some ProCreate putty and added some more tendrils to cover the base up a bit more. I wasn’t too careful, as the base will get a hefty dose of glue and gloss varnish to make it look nasty and wet. I’m pretty happy with it at the moment! Another thing that I’ve recently been interested in is the Witcher franchise. If you’re not familiar with it, it’s a grim and gritty fantasy world created by Polish writer Andrzej Sapkowski, focusing on a witcher – a monster hunter – named Geralt of Rivia. There are books, games, comics and even a cheapish tv series (which has also been cut into a poor movie) available. I bought the PC games years ago in a Steam sale, and they’ve been sitting unplayed ever since. I finally decided to tackle them, and it was a great call. Altogether I spent some 60+ hours on The Witcher and The Witcher 2 and read three of the four published books. While the idea of a small project based on the franchise isn’t a far-fetched idea, I decided to start small – with a single miniature. Naturally it was Geralt himself, the White Wolf of Rivia. I went for a quick plastic and putty type of thing, and knocked him together from a bunch of old WHFB Empire plastic pieces. I roughly shaved a bearded plastic head, resculpted the mouth area and turned his fancy leggings into boots. All in all, it’s rough with mould lines, uneven putty and the like, but hey, it should look decent once painted. Again I went in more with inspiration than self-criticism, which seems to be a good choice! I haven’t done fantasy miniatures in ages, so this was a fun diversion. Who knows!